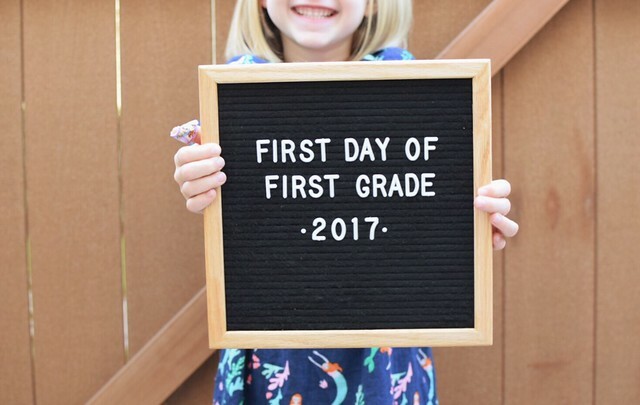 Last week, we started our homeschooling year and Eisley officially became a first grader. I thought it would be fun to share our curriculum choices for the year, as well as everything else we're planning as we begin our first "official" year of homeschooling! All states within the US have different laws for homeschoolers, and although I think the age a child must be enrolled in school is rather young in our state of California (age six by September 1st of that school year—some states are as late as age 8), we definitely have some freedom with our choices, as far as how we want to homeschool. The two most common ways to homeschool within our state are either through a charter (still teaching at home, but using the charter school funds to purchase classes, curriculum, supplies, etc. through approved vendors—also meeting with the charter each month to provide samples of your child's work in all required subjects, and completing required testing) or to register your home as a private school (registering through the state as an official private school, receiving no funds, but also having complete freedom from testing or other state-required curriculum standards). Although it was so tempting to join a charter and have use of the funds for our curriculum and such, I ended up deciding to register as a private school after a lot of thought. For those who are curious, here is an outline of our plans for Eisley's first grade year! Ambleside Online — We are following a Charlotte Mason style of education this year (here's a short article that give you an idea of what it looks like) and the Ambleside website has a weekly schedule for the entire school year (with comprehensive outlines and book lists). We are beginning with Year 1 and following their schedule for the following subjects: Bible, History, Geography, Science, and Literature/Poetry. There is a heavy emphasis on learning through classic literature, and much of what is taught to the child is presented through what are called "living" books. Many of these books I was able to find on Amazon, and the rest I found at our library or will be listening to for free through Librivox (free public domain audiobooks—who knew there was such a thing?). Exploring Nature with Children — I'm most excited about this natural science curriculum, which is very popular with the homeschooling crowd. This year-long curriculum provides week-by-week outlines for nature study, including: themed nature walks, themed book lists, poetry, art appreciation, recommended chapters from The Handbook of Nature Study, and extension activities. It covers a wide variety of subjects each week and is beautifully organized. And the entire thing is only $15. (Yes, please!) We printed the eBook and put it into a binder for easy access. — Every morning we have what is called Morning Time, which is about 30 minutes of the following: calendar, prayers, Bible story, memory verse, hymn, our current read-aloud, and (depending on the day) poetry, art appreciation or craft project. — We continue to attend a weekly homeschool co-op, which includes about 8 families. There is a weekly lesson/craft and a bunch of time for the kids to just play together. It has been such a benefit for us! — Although Eisley has been reading since she was 4 1/2 (and is currently reading far beyond her age level), we use the Teach Your Monster to Read website to reinforce phonics concepts here and there. It's totally free and features some very fun games. — I purchased a Scholastic workbook from Costco for less than $8, and we use that to supplement what she is learning. — I'm borderline obsessed with finding free printable resources on Pinterest to supplement different subjects! If you want to follow my homeschooling boards, here they are: First Grade (for Eisley) and Tot School (for Cora). — As her first extracurricular activity, Eisley is joining American Heritage Girls this month, which is a faith-based scouting program (very similar to Girl Scouts, but a Christian organization). — We've loved the programming on PBS Kids for years now, and it's kind of amazing how much Eisley is able to learn through programs like Odd Squad, Cyber Chase and Wild Kratts. The games on their website are also pretty fantastic! During our first week of school, Eisley went back and forth between, "Ugh, I wish I never had to do school!" and, "I'm so excited for school today!" The homeschool life isn't all rainbows and handicrafts, my friends. But what I love about homeschooling during these early years is that we can get all of our school done in the morning and have the rest of the day for creative projects, free play, outings, and anything else we have planned. I'm pretty passionate about keeping lessons short and consistent, making reading and books a huge priority, and giving my daughters plenty of time to play, create and explore during early childhood. I am also sure to keep our schedule very simple and not fill up every day with commitments and extracurriculars. There are enough years ahead for that—I want to keep our life simple these days! We can complete Eisley's daily lessons in an hour every day, which I'm sure probably sounds absolutely outrageous to those who are unfamiliar with homeschooling. But when you stop to think about it, it's like having a one-on-one tutor for your child, covering the main subjects—and some subjects aren't covered every day. Because I know my daughter so well, and am completely familiar with her strengths and weaknesses, I'm able to create a daily schedule that gets the most done in the least amount of time. There is no time wasted on busy work (although, I must say, the girl loves random worksheets and I'm sure to offer them when she's eager!) or a continuing assessment of her skill level. She's my only student, so I'm keenly aware of anything that needs extra work or anything she has already mastered. In addition, that hour doesn't include any free reading, writing or other miscellaneous work she does within the span of a day. I'm grateful to have a child who considers reading a passion (she reads at least an hour each day on her own) and loves sitting down to do copywork or write letters to friends and family. She learns so much outside of regular lessons—it's pretty amazing to watch. Well, that was a pretty long-winded explanation of our plans for the school year—but I feel like I could write about a dozen paragraphs more. I tend to nerd out when other homeschoolers share their plans, so hopefully this has inspired a few of you out there! As we go along, I'm sure things may change, but it definitely feels good to be more organized than I ever have been before. More than ever, I feel so confident in our choice to homeschool, and I can't wait to see all we end up learning and experiencing this year. As you know, I don't have any kids myself, but reading about homeschooling is pretty interesting for me.... because in Germany, homeschooling is not allowed. Every child has to be enrolled in school by age 6 and that is that. No option to homeschool or to delay (unless for serious reasons). I am still going a bit back and forth about what I think about homeschooling, but I am interested to follow your posts and learn more about it. I have a good friend who is also from Germany, and she also seems a bit curious about the whole thing—I guess now I know why! I had no idea it was illegal in Germany. (Making something illegal definitely casts a negative light on whatever is in question.) I guess the biggest point I want to make with anyone who knows little about homeschooling is that there are seemingly endless ways to go about it...there is no one "basic" homeschooling. Most homeschoolers I know are choosing methods or styles different from my own, which makes it hard for even me to speak about our choice in broad, sweeping statements! Also, decades ago, a large portion of homeschoolers were more religious-minded, whereas now there is a substantial movement of people who aren't religious at all who are choosing to homeschool their kids. There's such a wide spectrum of people choosing to educate their children at home (or, more accurately, "in the world") these days, it's kind of amazing! I cannot tell you how happy I am that you are back to blogging. I occasionally check back "just in case," but came to terms with the fact that you might not come back. You probably don't remember, but your writing and advice helped me through so much when I was in high school and college. I am a sixth grade teacher now. It's a far cry from first, but if there is anything I can help you with in your planning, please let me know! Also, I know a lot of places that give teacher discounts to homeschool teachers with your affidavit. So excited about your announcement of a new little one on the way! :) Congratulations!